Character creation is one of the most difficult and demanding tasks in the art of storytelling. Some people have a talent for it—I think Charles Dickens was one of these—while the rest of us have to stretch out a thinner talent by relying on technique. In this series of posts about character creation, I am showing you my own approach to that aspect of the craft, based on what I have been able to learn so far. My education is ongoing and most likely will not end before the end of my life. If you’re an observant person, psychologically astute, and interested in people, then you will have quite a lot of material on which to base fictional characters. But I’ve found that it doesn’t take too many stories for this fund of material to run dry. If you continue with the art of storytelling, sooner or later you will be faced with the task of creating characters from scratch. This is actually a blessing, for a scratch character can be shaped exactly to the needs of your story; you don’t have the awkward problem of trying to rejig your aunt Geraldine to be the bank manager in your story. For every good story has a point, and in such a story every character is helping you make your point. Characters crafted from scratch are in the best position to do this. In Part 1 I talked about the preliminary task of determining what kind of a story you are telling, and thereby establishing the kind and depth of characters it will require. I mentioned Orson Scott Card’s MICE quotient: figuring out the relative importance to your story of milieu, idea, character, and event. This series of posts is ostensibly about creating characters in epic fiction, but in fact most epics make use of fairly stock or archetypal characters. In Lord of the Rings, Gandalf is a wizard and he runs pretty true to type. The mission of that story does not include getting into the dark corners of his character. Indeed, I would say that J.R.R. Tolkien placed character at the bottom of his MICE quotient. I would put the relative priority of those 4 MICE factors for Lord of the Rings as MEIC: milieu, event, idea, character. My own epic, The Age of Pisces, I see differently. The order here would probably be: ICEM. For my work, character is higher in the stack, and I must accordingly pay more attention to the individuality of my characters. I want characters who feel lifelike and who compel the reader’s attention. And my story needs are such that I must construct these characters from scratch—or nearly so. Here’s how I go about it. The preliminary steps I mentioned in Part 1 are taken care of. My story is to be told in what Northrop Frye calls the “high mimetic” mode: it’s about heroic characters acting in the real world. My main characters have qualities that set them apart from the common run. Herod, for example, was unusually proud, ambitious, and effective as a man. He also had serious problems—or “issues” in today’s parlance. But these too lend weight to his larger-than-life character. When big characters have a dark side, it can be dark indeed. 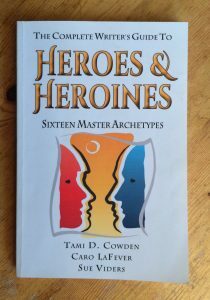 For my next step, I make use of a really good text that I’ve found, called The Complete Writer’s Guide to Heroes & Heroines: Sixteen Master Archetypes by Tami D. Cowden, Caro LaFever, and Sue Viders. These authors have examined a wide range of stories and discovered that their characters can be sorted into a set of 16 different “archetypes,” 8 male and 8 female. They find that each of these archetypes manifests in two different forms, so the text contains descriptions of a total of 32 different basic character types. But can all characters really be resolved down to these 8 archetypes? Well, yes—especially when you consider that it is possible in some cases to combine them (the authors talk about this). For example, my wife Kim and I have been watching the 1974 television miniseries Scenes from a Marriage, written and directed by Ingmar Bergman. For 6 episodes we watch the two protagonists, Johan and Marianne, while their marriage of 10 years undergoes the crisis of breakup. I hadn’t thought about it till this moment, but I would say that Johan’s archetype is that of the Professor, while Marianne’s is that of the Nurturer. But Johan may also bring in aspects of the Bad Boy, for he has a dark and disruptive side. The Professor’s strength is his intellect or special skills. Expert in one field or many, he has turned his life into one big science project. Every experience, every emotion has been the subject of objective examination. He is thoughtful, but not necessarily considerate. Expert: Not just smart, the Professor also is educated. Whatever his chosen field, he is the recognized authority. Analytical: This man thinks before he acts. He refuses to be rushed and his conclusions are invariably correct. Genuine: The Professor has not developed the disguises others have. When he gives his heart, he is painfully vulnerable. He never pretends something he does not actually feel. Hypocrisy and lies are foreign to him, and he is astonished when others use these weapons against him. Insular: He inhabits his own world and is unwilling to make room for others. Inhibited: He has not spent a lot of time building up his experience with women. He is either frantically trying to think of something to say, or he does not want to take the time to say hello. Inflexible: The Professor is set in his ways, and not enthusiastic at the prospect of change. An important point is that this is not an entire description of the character; this is the description of an archetype. The archetype is like a chassis; the rest of the character must still be built on it. But for a writer it makes a great starting point, for the archetype already has a feel, an attitude—even a sketched-in background. There is the making of a person here. And the key is that you’re building from the inside out. Unskilled character creation tends to start from externals and then search for something underneath the skin. Superior character creation starts from the inside and builds out. But I’ve said enough for this time—stay tuned for next time! In the meantime, take a look at my Creating Characters reading list (one of a growing collection). This entry was posted in thoughts, writer's notes and tagged Anatomy of Criticism by Northrop Frye, archetypes, Caro LaFever, character, Characters and Viewpoint by Orson Scott Card, Charles Dickens, creating characters, creating characters in epic fiction, female archetypes, Gandalf, Herod, high mimetic mode, Ingmar Bergman, JRR Tolkien, Lord of the Rings, male archetypes, MICE Quotient, Northrop Frye, Orson Scott Card, Scenes from a Marriage, Sue Viders, Tami D Cowden, The Age of Pisces, the complete writer's guide to heroes & heroines. Bookmark the permalink.